In case you are wondering why you can’t seem to curb sweet cravings—a new study out of Yale University has discovered that it is the calories that count, not the sweet taste. Researchers from Yale University investigated the effects sugar and non-nutritive sweeteners have on the brain. In other words, they wanted to evaluate whether it was the sweet taste that was triggering a response within the brain or the calorie count of the sugar or sweetener that elicited a response. 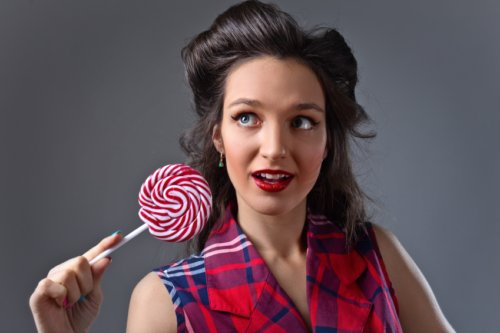 The region of the brain, called the striatum is responsible for understanding reward; it is also the area that processes both sweetness and calorie counts. This area is divided into two different sets of neurons that process these different signals. There is the ventral striatum (which is responsible for sense of taste) and the dorsal striatum (which is responsible for identifying compounds with nutritional and energy values). Their mouse study included 170 adult male mice, between the ages of eight and 20 weeks. Study mice had not previously been under any experimental conditions, were kept in cages housing no more than four mice, and were maintained under normal daytime and nighttime schedules. During the trial, they were individually housed and were randomized into various feeding groups where they fed or licked either a sucralose (sweetener) solution or a glucose solution. Further, mice were provided with sugary solutions that had aversive tastes but contained calories. Experiments were performed between 4pm and midnight to ensure regular feeding behaviors. Dopamine levels were measured through microdialysis. Findings revealed that the mice preferred the sugary solution that contained calories but lacked sweet flavoring compared to the sweetener solution, which was sweet-tasting but contained no calories. The brain responded to calorie counts differently than it did to just the sweet taste. Why the brain has a preference for actual calorie or nutritional values rather than for actual taste is mind boggling. Researchers are puzzled as to why sweeteners, which are much lower in calories yet hundreds of times sweeter than sugar, are incapable of satisfying that sweet tooth craving. “The sugar-responsive circuitry in the brain is therefore hardwired to prioritize calorie seeking over taste quality,” reported author, Ivan de Araujo . Perhaps this study will provide insight to healthcare professionals so that they can more effectively guide their patients on how to curb sugar cravings. Further studies are warranted; however, until then just remember, every calorie is what counts.